You may have marvelled at the new St Pancras and King's Cross stations, and stared in disbelief at the transformation taking place in this area of London. But did you know that, whilst these new massive structures were being created, amongst the rubble of the old, a community garden was busy growing food from skips, with a little help from the local builders? 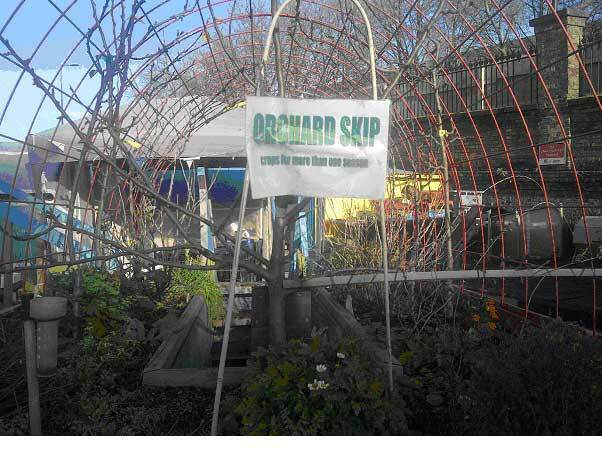 The Skip Garden was started in 2004 by Global Generation with the initial aim of taking kids to the country. They then decided to bring the country to the city at King's Cross and the garden has moved its skips and makeshift structures several times as the buildings around it have been completed. The garden has strong links with the building companies in the area and uses recycled materials from the King's Cross reconstruction site. Even the skips are disused ones and have been adapted to create walk-in gardens. Amongst an array of plants and activity, there’s a potager skip and an orchard skip, each with very close plantings, but very healthy plants, all due to the care spent on recycling. A cunning water recycling scheme links all the skips and planters and is supplemented by a wormery, composting and comfrey juice extraction to ensure that the soil is the very best – as it needs to be in this environment. The aim is to show that food can be grown anywhere – and it succeeds. For keen urban gardeners, there are lots of lessons and tips to be gained on how to grow vegetables organically, using the resources you find around you. Growing vegetables is used for educational purposes with young people, known as generators, recruited to help. They now sell produce to the many trendy restaurants which have sprung up in the area and have a makeshift kitchen where they host lunch and learning events every two months for the local community and produce jam and chutney for sale. 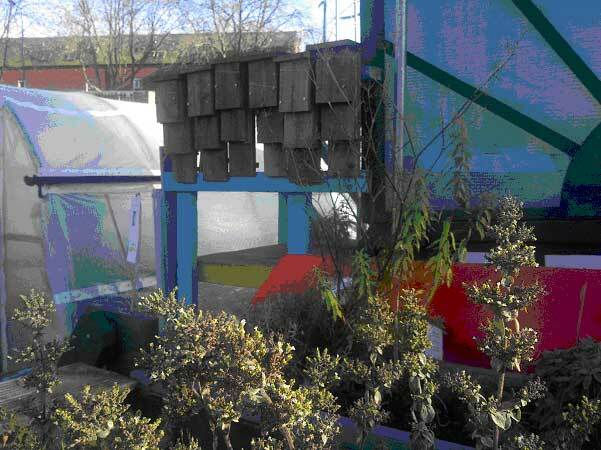 The students from Central St Martin's have got involved, so now vegetables are also being grown to use as dyes. The fabric and materials they have helped create will also be on display. It is the sight of fruit trees flourishing in skips and saffron harvested from a bed of crocuses which inspires the visitor. Bat boxes have been constructed amongst the vegetables and the wild, overrun banks of rubble nearby have been planted with bee-friendly plants. The Skip Garden is not usually open to the public, but over Open Garden Squares Weekend on June 8th and 9th you can visit it and for the first time sample the delights of its kitchen as well as its garden. Paul and Silvia and the generators will organise a tour of the skips, the recently constructed yurt, the clay pizza ovens and the chance will be yours to see at first hand how vegetables and herbs of all kinds can be produced in such small spaces. Who would have thought such a garden existed behind the cranes which dominate the King's Cross skyline? And when your visit is over, there are several other gardens to visit nearby, and the chance to sample the delights of this newly-recreated area of London.